The performance of West Indian children in British schools has been the subject of enquiries by both a parliamentary select committee and the Department of Education. It is widely believed that an important factor in the relative failure of West Indian children is the language they use, West Indian Creole, and while teachers and others who work with them are aware that their language is often very different from British English, they seldom understand the nature of the differences, or their implications. 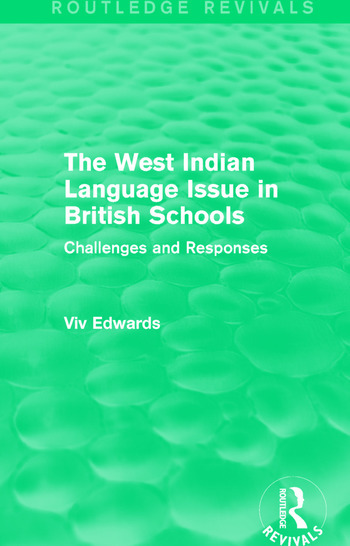 The aim of this book is to provide the non-specialist with an account of the language of West Indian children and to examine how linguistic ‘interference’ can affect their level of reading, writing and understanding, even when they have been born in Britain. It also considers the worrying possibility that negative attitudes towards them and their language may have an adverse effect on their motivation to learn standard English. Viv Edwards places great stress on the fact that, although Creole is different from British English, it is in no way deficient as a language. She emphasizes the importance of familiarity with the structure of Creole, since it is only in this way that the teachers can discriminate between real mistakes and Creole ‘interference’. Attention is drawn to the relationship between language attitudes and social stereotypes and the danger that these might be translated into reality. Different strategies available to the teacher are examined, drawing on American experience in this field, and various initiatives taken by British teachers are described, thus making the study a work of practical value to teachers and others.